Sometimes life just seems so incredibly unfair. A mother having to bury her own child. A young wife and mother losing her battle with cancer only six weeks after being diagnosed. A friend continually battling each and every day in the depths and darkness of depression. I just want to cry out to God and ask him again “Why?” (This is not the first time I have asked God why and had to search for God’s grace in my life!) And it is especially during these days and times that I wonder where in the world God’s grace is. Are you looking for it too friends? I know it is there, but it is so very hard to find during these times. It is as if the gift of grace sitting on the table has been obstructed by everything else in its path. It is like feeling our way through a dark room. We have to wind our way through darkness and the obstructions until we reach the table where God’s grace is laid out for us to receive. God’s grace is always and ever enough! But there are days that I forget that promise for sure. And there are days that the sweetness of God’s sufficient grace feels awfully bitter! 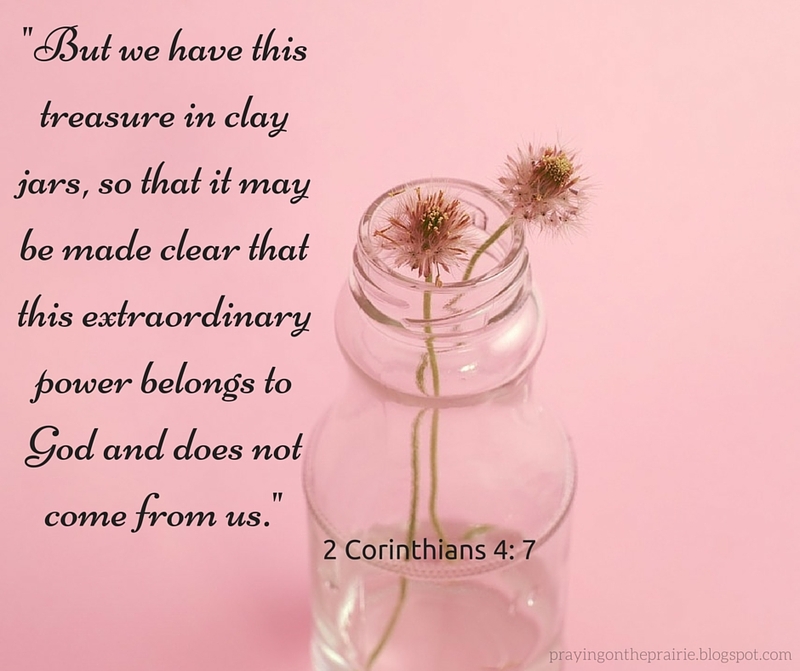 But the the truth is, like a beautiful stained glass window or even a clay jar, God’s grace shines through the cracks. God’s grace lights the way in the midst of the darkness. God’s grace opens our eyes to see and our ears to hear the magnificence of God’s grace even in the most difficult of times. God’s grace carries us especially when we feel like that grace isn’t anywhere in sight. God’s grace allows that light to shine from within each of us when we offer grace to one another. God’s grace allows that light to shine from within when we hold each other up in prayer. God’s grace allows that light to shine from within when we journey with one another. God’s grace is a gift given freely to God’s people to sustain us on the hard days and the not so hard days. It is especially there for the days when we don’t experience the grace but rather taste the bitterness in our mouths. This video gave me goosebumps! Enjoy! Readers, don’t forget to register to win a $500 DaySpring shopping Spree. Click here for a chance to win. This entry was posted in Uncategorized and tagged #write31 days, 31 Stories of God's grace, Amazing grace, BYU Noteworthy Acapella Cover, Elisabeth Kubler-Ross by tara.ulrich. Bookmark the permalink. I love that 2 of the posts I'm reading today start with that verse which is what I needed to jear today. Those tough times certainly make it tough to see where His grace is. I have found that the fight to get there makes it all the more sweet when I get back to that place of feeling God's grace and presence. I pray it is the same for you. Isn't it funny how God knows what we need to hear, read, etc. Yes indeed the tough times doe make it hard to see where God's grace is. But I promise you friend, it is there. Hey friend! Great post. Love your words, as always. Especially this my heart needed today: "God's grace carries us especially when we feel like that grace isn't anywhere in sight." Thank you. The video and song rendition was incredible. Goosebumps! Bless you!! Thanks friend! I thought the video and song was incredible too. I totally got goosebumps too. Bless you too friend! This was lovely, my friend. A wonderful reminder that God does indeed use every place of brokenness for His glory and our good! Praying for your heart as you mourn the recent loss of your friend, Tara!!! I know the pain sweet friend and I am so grateful that Jesus knows it too!!!! Beautiful cover of Amazing Grace – one of my favorite hymns along with "It Is Well With My Soul"! The prayers are so greatly appreciated. I too am grateful that Jesus knows the pain too. I am so glad I could share one of your fave hymns here.